Last week’s UK General Election was unusual in many ways. We saw the abandonment of many election traditions, particularly in the way the various parties marketed and promoted themselves. Instead we saw creative and unusual ways of talking to the public, especially via social media channels. 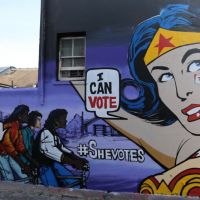 In this article, we focus on one such example, with Ella Saltmarshe of The Comms Lab explaining how she and a group of friends used creative thinking to encourage young women to vote.